The 29 Apollo astronauts tended to originate in the American heartland, in such places as Weatherford, Okla.; Columbus, Ohio; Jackson, Mich.; and St. Francis, Kans. Four states gave birth to three astronauts each: Texas, Ohio, New Jersey, and Illinois. Only one astronaut was born in New England, and none in New York City; only two in the Deep South and two on the West Coast. Birthplaces in the twentieth century can be deceptive, however: Frank Borman was born in a steel-mill town, Gary, Ind., but because he was a sickly child (sinus problems and mastoiditis) his family moved to Arizona; John Young first saw light in San Francisco, but his accent was authentic grits and red-eye because he grew up in Orlando and rural Georgia and attended Georgia Tech (where he stood second in engineering). Two were born overseas of U.S. families, Anders in Hong Kong and Collins in Rome. Coming down easy on an unknown surface with limited fuel would take great piloting skill. 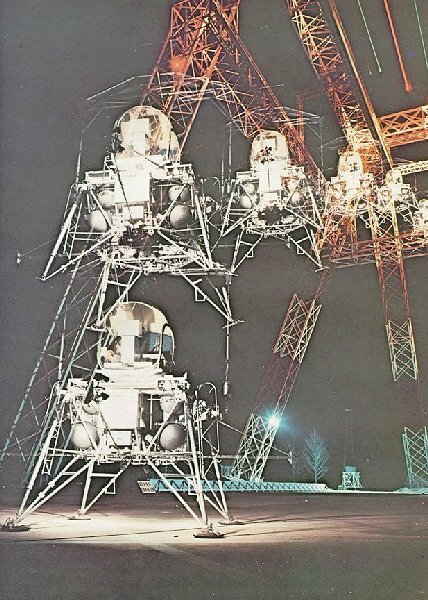 This giant gantry at the Langley Research Center was used by research pilots to aid LM design, and to explore piloting techniques having the least risk of damage or upset. This multiple-exposure shot shows a landing with little forward movement at touchdown. The average Apollo Astronaut was medium-sized, slightly under 5 ft 10 in., about 160 pounds. He was 38.6 years old when he made his flight or, in the case of the four who flew two Apollo missions, his first one. The blue-eyed outnumbered the brown, 16 to 8, and five had eyes described as hazel or green. Nineteen had (or had had) brown hair, seven blond, one black, and there were two redheads, Schweickart and Roosa. Six of them were well over on the bald side, Stafford almost at the peeled-egg stage. The twenty-seven who were married (Swigert and Schmitt were not) produced an average of 2.8 children. Generally the astronauts - twenty-three Protestants and six Catholics - adhered more closely to formal religion than their contemporaries; a high proportion of them served as elders, stewards, deacons, or vestrymen. Presbyterian Aldrin administered holy communion to himself inside Eagle after it landed on the Moon, and when Frank Borman was orbiting the Moon he apologized to his fellow members of St. Christopher's Episcopal Church because his absence made it impossible for him to serve as a lay reader on Christmas Eve. The prayer he did say reached a somewhat larger audience and caused an atheist to sue NASA, unsuccessfully, on a separation-of-state-and-church issue. The astronauts were big on sports and flashy cars, but weak in the classics. Mike Collins, who combined the fastest game of handball (nobody could even come close to beating him) with a taste for literature, used to say that the space program needed more English majors to get away from the engineerese in the exhaustive checklists. He proved his versatility by writing a literate, perceptive, and witty book called Carrying the Fire.